We've expanded the roster of pro golfers to now include the stars of golf's early, EARLY years with the Pioneer Golfer cards for HISTORY MAKER GOLF! NOW available! A number of folks wondered why such greats as Walter Hagen, Bobby Jones and Harry Vardon weren't included in our "All-Time Greats" cards. Mainly, it was because golf was a different game before the first world war. HMG is designed to represent contemporary pro golf, thus our list of All-Time Great golfers was drawn from standings and money finishes with the current pro organization, which was formed in the mid 1930s. However, PLAAY gamers convinced us that there's space in the game for a collection of golfers from the founding era of pro golf—and here it is! The Pioneers cards for HISTORY MAKER GOLF includes 54 pioneer golfers, from the last half of the 1800s and the first couple decades of the 1900s. Both European and American golfers are included. Statistics were, of course, hard to come by, so we relied on our experts, old golf tournament publications and documents, and anecdotal evidence. Each golfer has been rated as they might be expected to perform in "modern" golf. That is, those who were known as great putters or long hitters have been given cards that will reflect those traits. The top golfers of the early era, then, will be able to golf competitively with the stars of the modern era. The Royal Isle of Wight Golf Course, established in 1882, was one of the very first golf courses in England, and was nearly as famous as the club at St. Andrews. Many of the big stars of the day frequented this course, and Pioneer golfer Horace Rawlins was a member. Queen Victoria's eldest song (Edward VII) was a member, adding "Royal" to the course's name. A delightful seaside setting with frequently scheduled commercial arrivals and departures, many celebrities (actor David Niven, for one) made it a destination for some relaxation and a round of golf. But it never recovered from WWII and in the 1960s the course was handed over to the government for preservation as an historical site. The original Ardeer Golf Links of Scotland were situated around the sandy hills of Stevenston, and opened to great fanfare in 1880. Having enlisted the expertise of St. Andrews champion Jamie Anderson to design the course, it quickly earned a reputation as one of the very finest golf courses in all of Scotland. Club membership quickly grew, but in the early 1900s soil conditions began to deteriorate. In 1905, the original course was abandoned and a new course opened nearby on more suitable ground across from the Mineral Railway. While the course has long since disappeared, the impressive red brick clubhouse from the original course is still standing. The Royal Isle of Wight and Ardeer Links course cards are designed to reflect "pioneer" golf, played with niblicks, mashies, cleeks and spoons. Scores will be higher, distances shorter. It'll feel like you've gone back in time to experience golf from the Pioneer era! AND, you can put knickers on today's stars and send THEM back in time, too! 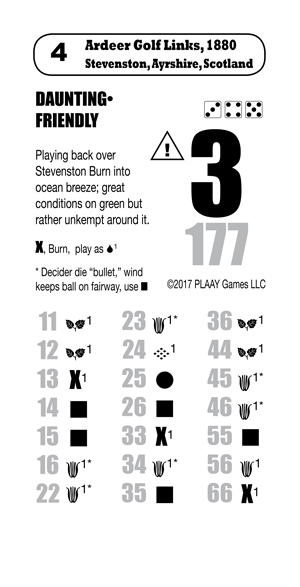 Combining the Pioneer golfer cards with other HMG sets, you can hold inter-generational "what-if" tournaments and match play events, with the action alternating between "then" and "now!" Who's the greatest golfer of all-time? Now you can settle it on your tabletop! Or, stick to intra-era play and experience realistic turn-of-the-century golf! The Pioneers golfer cards for HMG includes cards for 54 old-time golfers, two nine-hole 19th century courses, for $16 postage-paid! NOW AVAILABLE!